When you’re running a business online, social media can become your great ally in its promotion. However, it’s important to always measure your social media performance — and by performance, we don’t mean user engagement, i.e. likes, shares, and audience growth. What should matter most for businesses are conversions: sales, newsletter subscriptions, or website signups, any target action depending on your goals. You should not only measure total conversions and revenue but track which marketing channel brings more sales and is the most profitable in terms of marketing spends vs revenue. To get such data, you need your conversions to be aggregated to channels correctly. One of the most convenient ways to measure and analyze traffic from social media is adding UTM tags to all the links you post. In this article, we’re going to overview what the UTM tags are, how to use them, and how to make using them easier. What are the UTM Tags? UTM tags, or UTM codes, are the variables you add to the links to track and analyze the pages’ traffic sources. When a marketing analyst uses UTMs and understands how the audience engages with the content, they can adjust the content plan accordingly and have a clear understanding of which content affects conversions the most. All page clicks, with the social media source. For example, if you’re promoting several new products on social media, you can measure which one attracts more clicks. Or if your company runs a blog, you can find out which articles are more appealing to the customers. New and returning visitors. See how well your social media works for initial user acquisition and establishing solid relationships with returning customers. Bounce rate. Measure how much of your social traffic is, well, useless for business. Conversions from social media. I. e. sales, signups, newsletter subscriptions, time spent on pages—anything you set as a goal in your analytics suite. UTMs will help you track both direct and assisted conversions from social media. Social media performance. Which social network works best for your online shop? What is your target audience’s network of choice? UTMs can also help you get rid of most of the Deep Social traffic, the traffic from social networks that for some reason can’t be recognized by the analytics service you’re using. utm_source is a variable used to identify the source of incoming traffic, or the Referrer. When you’re measuring social traffic, Source is usually the name of the social network your link or your ad appears on. Note that for your analytics suite supporting UTMs facebook and facebook.com are two different social sources. To receive accurate reports you should have a standard for source names. utm_medium describes the way the link is delivered to the user. The medium for social network campaigns is usually social. utm_campaign is a name or even a number you give to a certain campaign your post or letter promotes. It describes the reason why the link is delivered. Let’s say you’re running a jewelry store and you have just launched a new collection. So, the appropriate name for that campaign would be the name of the collection. 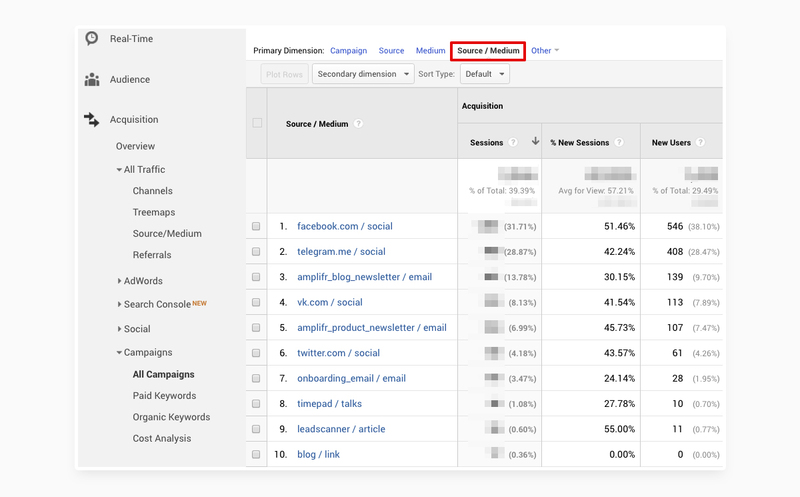 If you’re using Google Analytics, UTMs are most useful in your Acquisition and Conversions reports. We’re already adding UTM codes to everything we post, so we can check our most useful traffic sources in the reports right away. 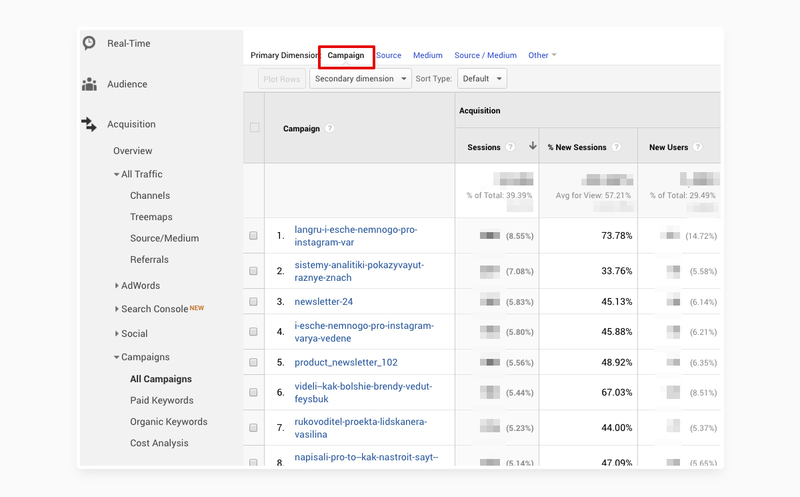 Go to Acquisition → Campaigns → All Campaigns and set Source / Medium as your primary dimension to see which channel performs best for your website. As you can see, for us at Amplifr it’s social traffic from Facebook. To check on campaign performance, set Campaign as primary dimension. Here we have several Russian blog article announcements and our most recent newsletter in top-5. Now it’s only up to us how to use the received data. Maybe we should we promote our Facebook posts more? Should we write more articles on Instagram? Always shorten the links you mark up with UTMs. A long multi-level link with UTMs may not look great on your socials — some users can’t stand the very thought of being tracked by evil marketing analysts trying to sell them things. Benefit from shortening your links—the link shorteners make long links look prettier and also count clicks for you! 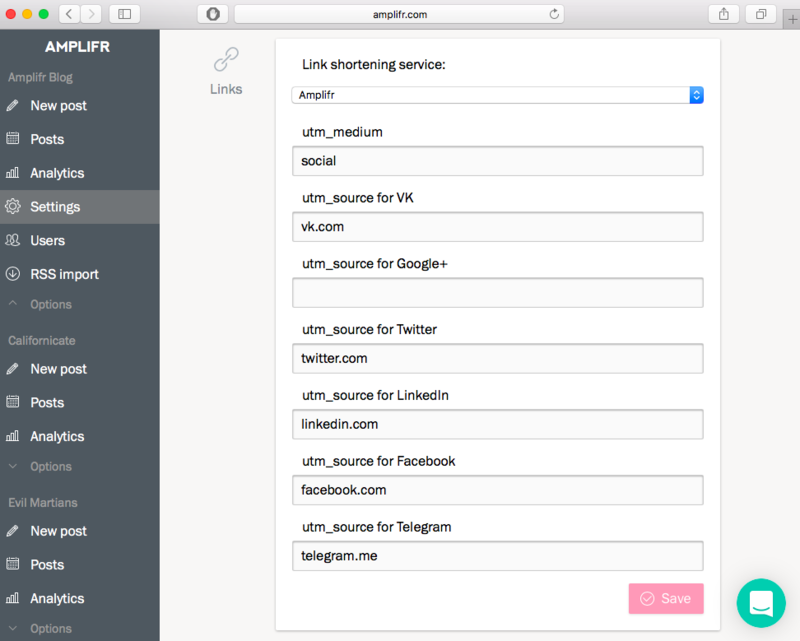 Use bit.ly, goo.gl, or Amplifr’s shortener. Use services that add UTMs to your links automatically. Writing UTMs manually is not that hard, just use the source-medium-campaign scheme we showed above. There’s a chance you may mess something up or simply forget to add them though. Also, it takes time. A service that adds UTMs to all the links you post automatically may come in handy. Amplifr, for example, does that—and shortens the links too. 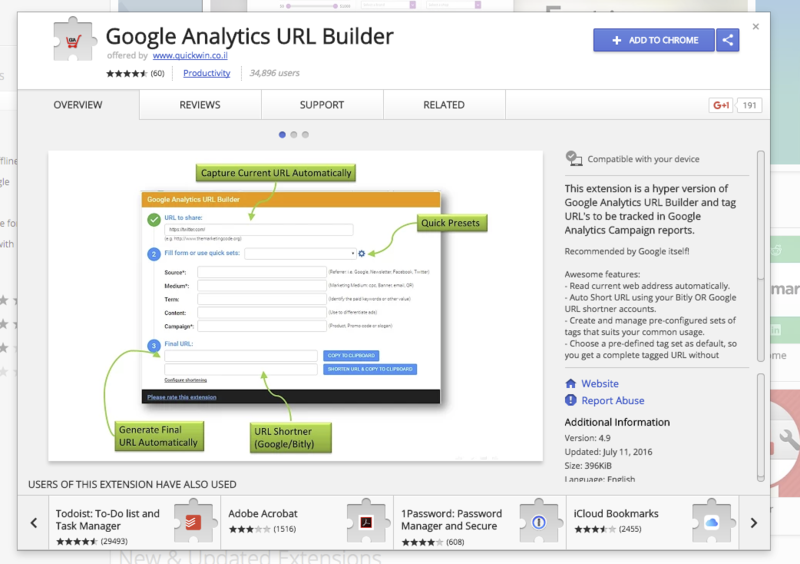 Another option is using a browser extension, such as this Google Analytics URL Builder extension for Chrome. This extension creates custom UTM tags and shortens the links as well. We hope UTM tags will come in handy for your online business analytics. Drop us a line If you have questions about using UTMs or social media analytics in general, we’re always glad to help. Daria is a writer, editor, and social media marketing manager. Also a coffee enthusiast, a dog person, and an amateur pole gymnast.